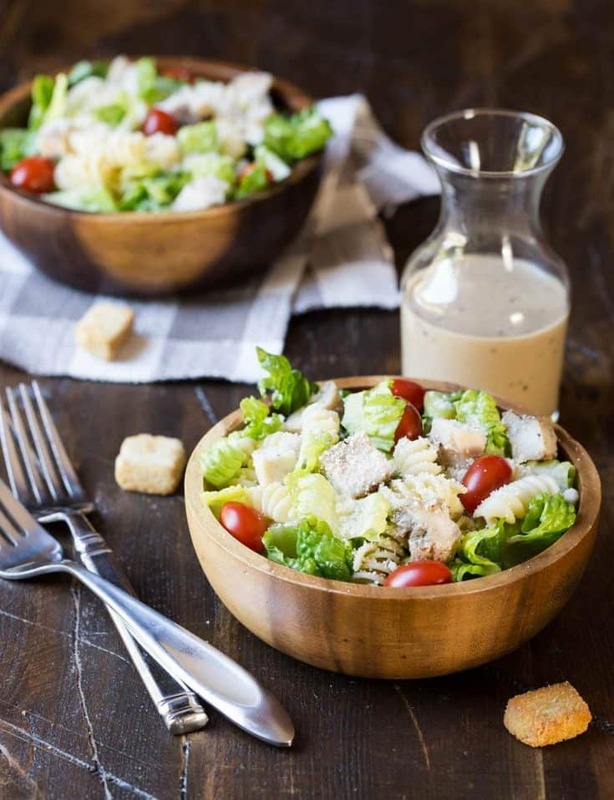 I took all of our favorites and combined it into one to make this simple and delicious Grilled Chicken Caesar Pasta Salad. 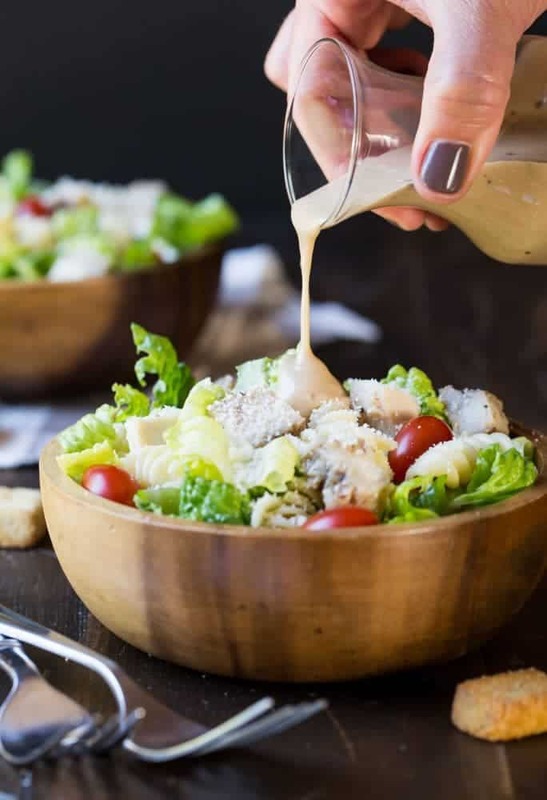 Pasta is always a hit in my house, but I have to admit that Kevin was a bit of a skeptic when he saw pasta and lettuce in this Grilled Chicken Caesar Pasta Salad. But after one bite, he was hooked. And with good reason. This easy recipe is so flavorful, pretty and versatile, it has quickly moved into the regular dinner rotation. It is easy enough for a weeknight meal, perfect for busy nights on the run and great for feeding a group. 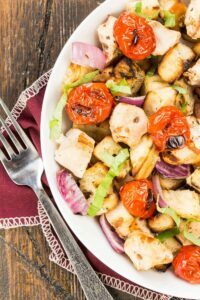 Filled with crisp romaine, grilled chicken chunks and pasta, this Grilled Chicken Caesar Pasta Salad pleases everyone in my family. It’s just an added bonus that it is a simple way to get some greens into Greta. Granted she has more pasta in her bowl than lettuce, but even she loves the addition of the chopped romaine.And since it’s all combined in one bowl, that means less work for me, especially when I can do all of the prep ahead of time. Grill the chicken earlier in the day. Cut into chunks and refrigerate until ready to assemble. Clean and chop the lettuce earlier in the day, too. Place in a resealable bag in crisper until you’re ready to serve. Use your favorite bottled Caesar Dressing to save prep time. Cook pasta ahead of time and toss with a bit of olive oil to prevent sticking. When you are ready to eat, simply assemble the salad and heat some crusty bread. The result is an easy and satisfying meal that can feed a crowd. Tip: if you are lucky enough to have leftovers for lunch, remove the lettuce before refrigerating. Add fresh lettuce right before eating because no one likes soggy lettuce. Combine chicken, pasta. lettuce, parmesan and tomatoes in a large bowl. 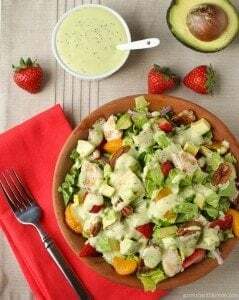 Add desired amount of Caesar Dressing and toss to coat. Season to taste with fresh cracked pepper. Garnish with croutons and serve with additional parmesan if desired. 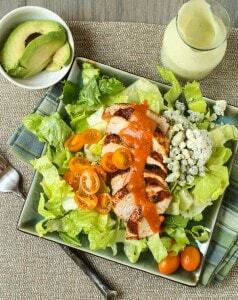 Need more ideas for Entree Salads? These are some of our favorites!